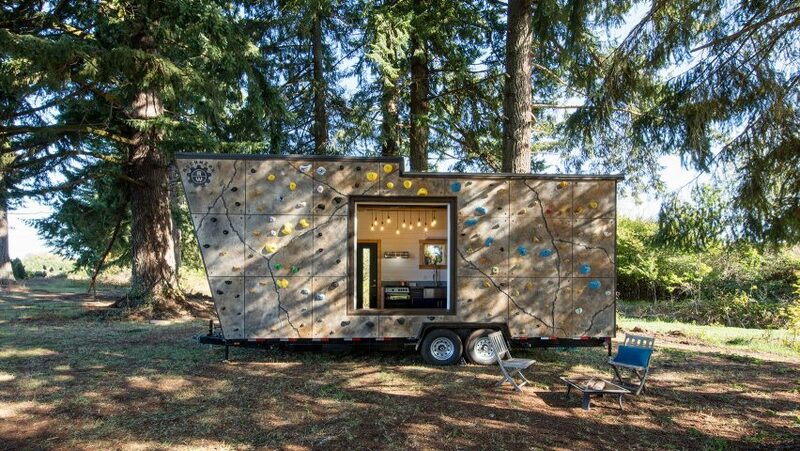 A climbing wall covers one side of this small mobile home by American company Tiny Heirloom. 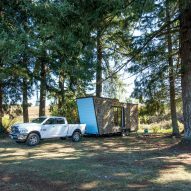 Designed for "adventure wherever you go", the micro home can be attached to the back of a vehicle like a trailer or caravan, and towed to the desired location. Along one of its longer sides is a moulded rock wall for climbers to practise their skills. The same feature can be found on the exterior of a house in Wyoming. To make the most of the tight space inside, the wooden dining table lowers to align with its benches – forming a sleeping area. "One minute you have a large dining table seating six comfortable, then with the push of a button, the table lowers creating a space for a queen size bed," said the company. 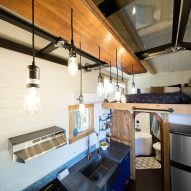 A mezzanine above accommodates an office space for working on the go, and is reached either by ladder or clambering on the furniture. 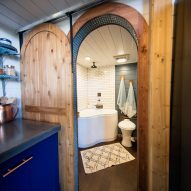 At the other end, another bed sits above the enclosed bathroom, accessed through a tiled archway. 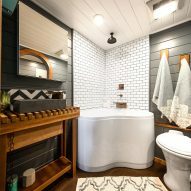 "Warm colours, custom wood working and a jet-filled tub make this one of the most desirable bathrooms," said Tiny Heirloom. 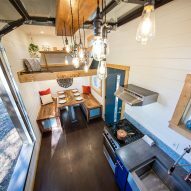 The cabin also comes with a basic kitchen, including an oven, stove, sink and fridge. 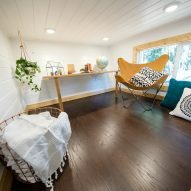 A large window that punctures the climbing wall and four smaller openings on the other side allow light into the compact space, which is decorated white, with wood details and turquoise accents. 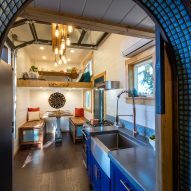 "A combination of modern industrialism and boho craftsmanship captures our client's unique style that sets the tone for their whimsical life," said Tiny Heirloom. 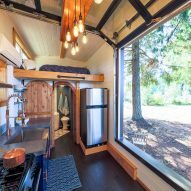 Micro cabins are becoming an increasingly popular option for Americans looking for a quick and easy escape from the city. 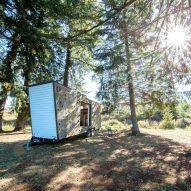 A group of Harvard students developed a series of tiny vacation houses outside New York and Boston, while similar retreats have popped up in rural Colorado and Utah.